One Glass At A Time! Our mobile windshield replacement Austin TX is on your way. Are you here for broken windshield or damaged auto glass? Aztek Auto Glass LLC your best low price auto glass solutions in Austin TX windshield replacement chip repair, and will solve it today! 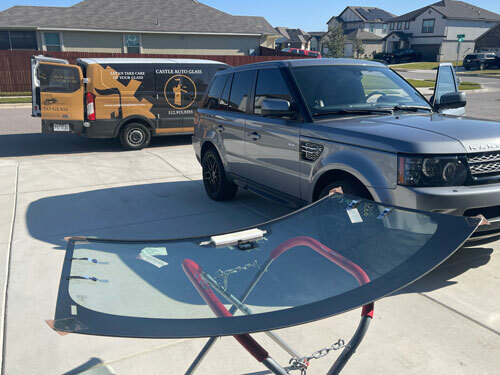 No matter whether you're at home, work or out and about South Austin or North Austin, a mobile windshield replacement unit will come right to you so you won't be forced to drive an unsafe vehicle. Aztek Auto Glass founded in 2002 in Austin TX with the objective to become the Top 1 best auto glass solutions replacement options available in Central, Texas. Up to today we already reached it and, still follow to keep that dream. We focus on delivering the most complete cheap low price auto glass solutions windshield replacement Austin Texas service: To be courteous, kind, helpful and, to offer the best auto glass windshield repairs material at the best price available. If you consider it urgency for an Austin TX windshield replacement...Call Right Now! Best price in the windshield replacement quote. Guaranteed auto glass replacement work. Time to completions 45-60 minutes. Windshield replacement Austin TX and windshield installation is our 12 hours every day permanent dream. We work hard to help you solve your windshield replacement Austin TX problems and to grow within the community. Serving our neighbors with all kind of auto glass replacements and auto glass repair services. Providing windshield safety protection and perfection at all times and, with all of your auto glass repair needs, one glass at a time! Our experienced auto glass repairs technicians, windshield replacement specialists and, installers will keep your vehicle in top condition. Your safety is important to us! Aztek Auto Glass guarantee using the up to date latest materials for auto glass windshield replacement to provide high-quality service. Our windshield replacement Austin Texas installer's team have been working together since our company creation date, are highly skilled and have accumulated more than 10 years of auto glass replacement Austin TX together with cars windows, sunroof windows, side front windows, side back windows, back glass, vent and quarter glass windshield repairs experience. Most of all: they love cars and care about yours. We will solve your problems! Whichever is your problem chipped or cracked windshield? Our experts can perform your auto glass repair or your windshield replacement quickly, without disrupting your day. We offer honest and reliable auto glass replacements, and we like to think we do it right. But, don’t just take our word for it - our customers give us rave online reviews - about our affordable windshield replacement cost. 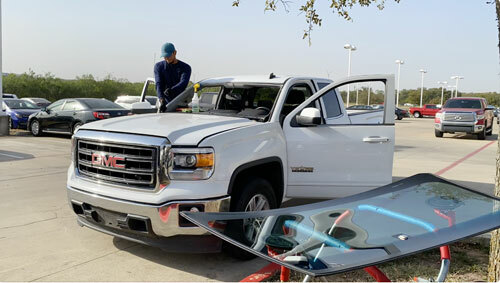 Aztek Auto Glass experience began doing small windshield replacement Austin TX and, auto glass replacements in Pflugerville, TX. Our windshield replacement requests grew huge that in order to be competitive, we needed to move to a new windshield replacement in Austin TX installment facility. Always focusing to provide cheap windshield replacement at all cost. And as we know that price matter, we have grown servicing and getting liked for our quick, quality, friendly service or the honesty and value we bring to every interaction. Our customers love us! Fair prices on windshield replacement cost. Who wouldn't call an affordable auto glass windshield repair and replacement company such as us? Try us to verify by yourself. Aztek Auto Glass Austin, TX is a one stop reliable solution for your vehicle windshield replacement or windshield repair needs. We accept most insurance regarding auto glass repair, auto glass solutions replacement and, windshield chip repair services. Remember us for your windshield replacement Austin TX. Call Right Now!.